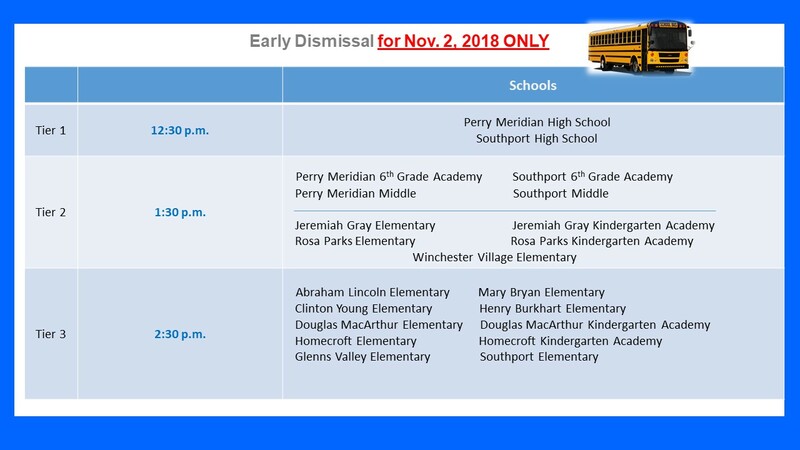 On this Friday, November 2 all Perry Township Schools will dismiss early in preparation for a visit from President Donald Trump and Vice President Mike Pence. Secret Service and law enforcement recommended early dismissal in anticipation of road closures and increased traffic. Students who attend Tier 1 schools will be released at 12:30 p.m. Tier 2 schools will release at 1:30 p.m.
Students who attend preschool at PTEC must be picked up no later than 2:45 p.m. Though his visit is to show support for a particular Senate candidate, Perry Township Schools is NOT endorsing any candidate. The federal government requested to use the Fieldhouse because it is one of the largest high school gyms in the country. The district agreed to accommodate the request just as it has done for other political leaders in the past, including President Bill Clinton who campaigned for then Senator Hillary Clinton at Perry Meridian Middle School during her bid to win the nomination for President in 2008. Diversity is a value we hold in high regard. We take pride in our diverse student population. English Learners make up 27 percent of our student body. We are committed to providing a safe, inclusive environment where all of our students can receive a high-quality education.